Many items urgently needed in Nyadire are available in the U.S. through donations or at a much-reduced cost. Transport by 40-foot-long ocean containers is the only cost-effective solution. Handling and shipping fees are $10,000 to $15,000 per container with a transit time of 4 to 6 months. Our objective is to send items that Nyadire specifically requires and requests, rather than simply gifting of personal articles. All items sent are cleared through customs and must meet all duty-free requirements. 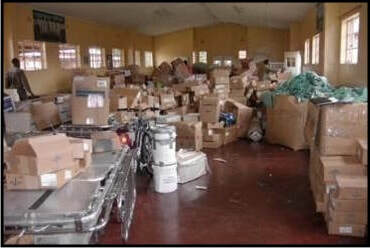 TNC typically works with the organization ZACH (Zimbabwe Association of Church Related Hospitals) to complete documentation and obtain clearances. TNC maintains a storage facility to accumulate items until a container shipment is scheduled. One or two containers are sent each year. TNC often partners with Brothers’ Brother (BBF) for space on BBF containers being sent to African nations. Examples include: X-Ray equipment, surgical tables, an autoclave, diverse medical supplies, back packs for students in the HOHO program, computers, 6,000 pair of Croc Shoes, educational and sports equipment for the schools, vehicle parts, hospital beds, maintenance and garden tools, new clothing, printed medical forms, paper, sewing machines, Girl Empowerment Pad materials, pastoral supplies, and more. If you have items to donate or access to organizations that provide medical or educational supplies please contact TNC at info@nyadire.org. Your financial donations are always needed in support of this program ministry.